PURE EXCLUSIVE is the exclusive series from WMF where LESS really is MORE. Since it is specifically designed to provide plenty of possible combinations, you can achieve more with fewer products – more design, more functionality. The combination of Cromargan®, wood and porcelain looks stylish without losing any of its practicality. Each product is designed to match the others and can be combined in a number of ways – and you can choose which one of the three wooden colour tones you like best! The new PURE EXCLUSIVE COLOUR opens up all sorts of unexpected possibilities. 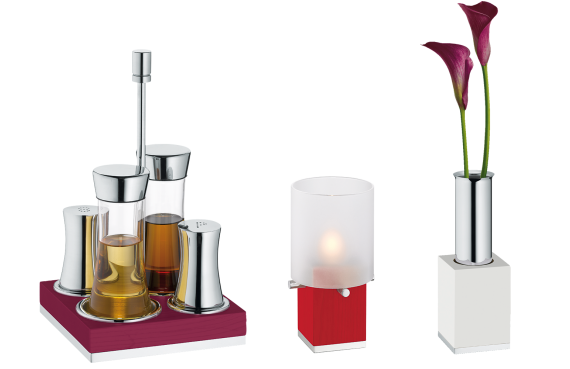 Customise the colour tones of these versatile products to match your dining area and table! We can develop any RAL colour tone just for you! Choose the products you want and add to them with the combination of articles you want in your desired colour tone – available in small quantities too! 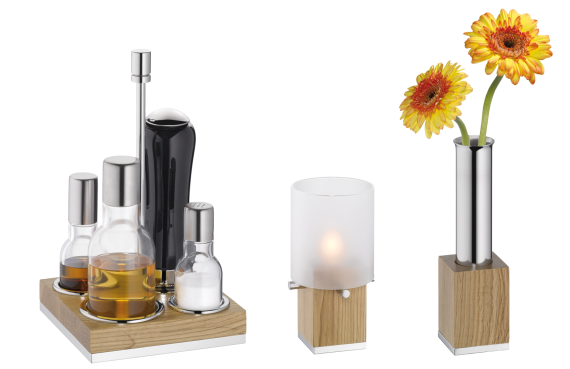 PURE EXCLUSIV ist die exklusive Serie von WMF, bei der aus WENIGER wirklich MEHR wird. Konsequent auf Kombinationsmöglichkeiten ausgelegt, erreichen Sie mit wenigen Produkten einfach mehr – mehr Design, mehr Funktionalität. 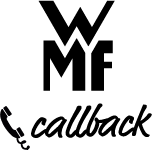 Die Kombination von Cromargan®, Holz und Porzellan wirkt edel und praktisch zugleich. Hier passt eins zum anderen und lässt sich flexibel einsetzen - in welcher von drei harmonischen Holztönen, bestimmen Sie! PURE EXCLUSIV CLASSIC besticht durch die Eleganz von dunkel gebeiztem Holz und setzt attraktive Akzente in Kombination mit anderen Farben und Styles. The CLASSIC collection stands for stylish serving containers made of high-quality Cromargan® or in a perfectly silver-plated design. From butter coolers to cloches, this series of stylish products features sophisticated designs, robust surfaces, and a high quality level which makes them well suited to the requirements of fine dining. Ice buckets, punch bowls or coolers for wine and sparkling wine let you perfect the art of serving drinks at a buffet or even directly at the table. Thanks to their high-quality workmanship, all of these products will be mainstays in your range of catering equipment for years to come. 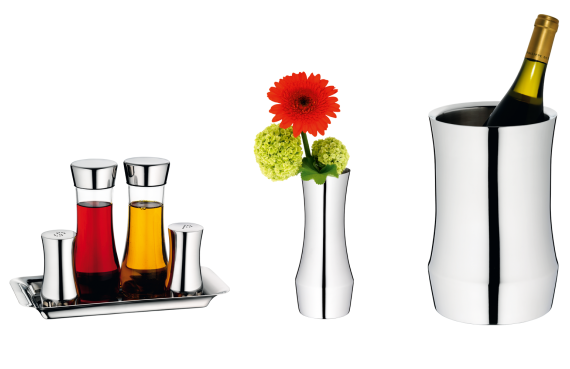 The new DIVA drinks cooler from WMF looks both elegant and stylish no matter what type of table arrangement you have on display. 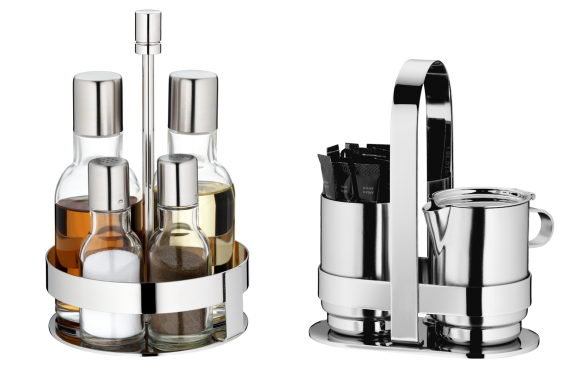 Whether used at meetings, on buffets or in elegant settings, DIVA emphasises its features effectively and offers ample space for up to six cold drink bottles or decanters. 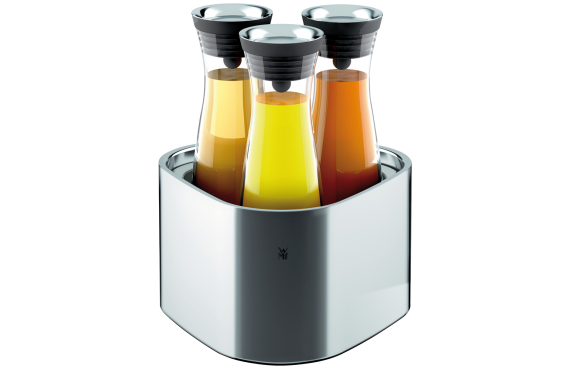 The double-walled containers are stackable, and together with their gel-filled cooling elements keep drinks cool and fresh for long periods of time. 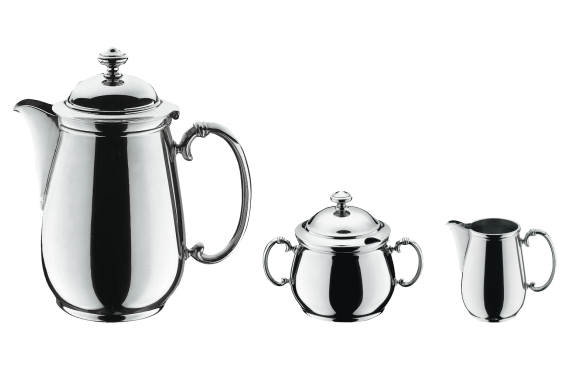 The PURE collection from WMF is characterised by pure forms without flourishes or embellishments. Pieces of serving equipment like stands and containers feature a stylish simplicity, which is emphasised even further through the use of high-quality Cromargan®. The same applies to white porcelain items in proven WMF quality. 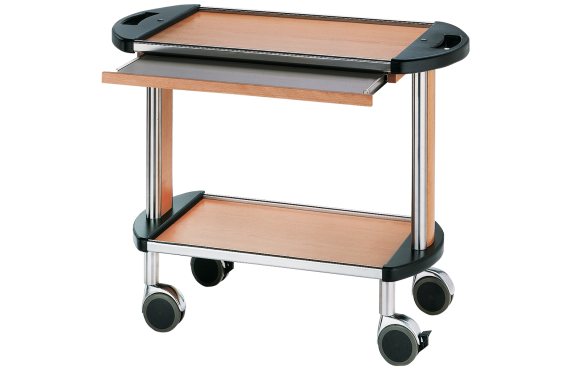 PURE can easily be incorporated into both a sophisticated buffet and a traditional breakfast buffet, while also offering functional and practical serving aids to supplement the standard range of equipment. The URBAN collection from WMF is all that its name suggests – and anything but rustic. It is modern, authentic, creative, chic, individual and simply stylish. The curved lines of the serving pieces and the decorative elements give each individual piece a graceful and light feel, which is aesthetically appealing in both contemporary and conventional environments. It is this versatility that makes URBAN a team player. It can be easily combined with other WMF products. 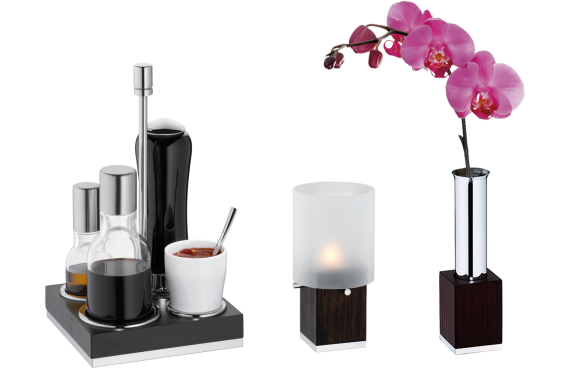 Its ideal companion could be the modern PURE EXCLUSIVE collection, for example, or even our pot series. The BISTRO collection comprises products ranging from stands to serving trays, which stand out with their timeless, elegant design. Premium Cromargan® meets unblemished glass. The combination of these two durable materials will complement your restaurant's classically modern style, plus all the products are easy to clean and can be combined with WMF's other collections. PURE EXCLUSIVE is the exclusive series from WMF where LESS really is MORE. Since it is specifically designed to provide plenty of possible combinations, you can achieve more with fewer products – more design, more functionality. The combination of Cromargan®, wood and porcelain looks stylish without losing any of its practicality. Each product is designed to match the others and can be combined in a number of ways – and you can choose which one of the three wooden colour tones you like best! PURE EXCLUSIVE NATURE's extraordinary wooden hue makes the natural look of high-quality oak wood the centre of attention, and is a real eyecatcher at the buffet and at the table.